Invented in 1994, Boomwhackers have become extremely popular worldwide in music education classrooms. They have won numerous awards and the colour coding has set the standard in the industry. Boomwhackers are easy to play and lots of fun! Each Boomwhacker can be played onto the palm of the hand, tapped onto the ground or played together to form a chord. They also sound great when bounced vertically onto the ground with an "Octavator" cap added onto one end, especially the bass set. Great for Drum Circles and a multitude of classroom activities for all ages. 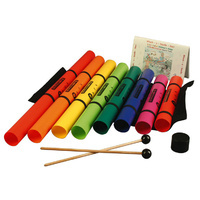 The Boomwhackers Chromatics Set consists of the 5 sharps/flats for our standard octave. It forms a different pentatonic scale, which has its own pleasing sound and combines with our Diatonic Set to form a full chromatic octave of 12 notes.